Preheat oven to 160°C (325°F). Line a 20cm square cake tin with non-stick baking paper. Place the dates, banana, cacao, almond meal, oil, vanilla and maple in a food processor and process until smooth. Pour the mixture into the prepared tin, scraping the sides of the processor with a spatula if you need to. Smooth the top and bake for 20 minutes or until just firm around the edges. 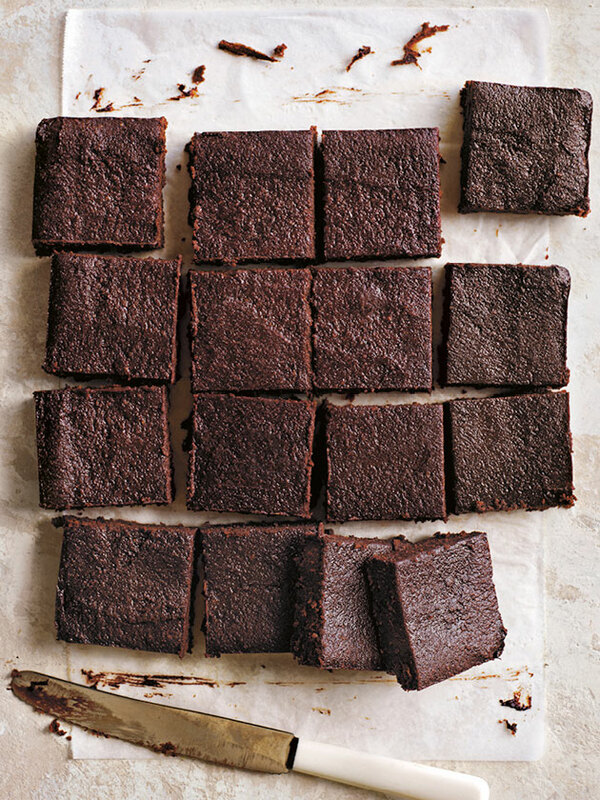 Wearing oven gloves, carefully remove the brownie from the oven and allow it to cool in the tin for 20 minutes. Place it in the fridge until chilled. Thanks for your question, Siobhan. We haven’t tested this recipe with ground seeds, however the recipe should work out similarly with ground sunflower seeds. Let us know how you go! The DH Team. I made this and the result was perfect! I made sure what I used was Vegan friendly for our friends and served it with Vanilla Coconut Yoghurt for them and dollop cream for the non Vegans. Will make again for sure. Hi, I’d like to make these (and the carrot cake from the kids Basic to Brilliance book) for the kids school lunchboxes. Can I sub the almond meal for plain flour or even ground sunflower seeds or pepitas to make them nut free?